Irises, tulips and daffodils are good bulb options for fall planting. Winterizing your AC unit depends on what part of the country you live in. But if yours is exposed to leaves, pine needles, nuts and the like, you’ll want to cover it during the fall months. You can make one yourself or buy one at a hardware or home store. You can also weigh it down with plywood to protect it from ice. Just be sure to remove the cover in spring to encourage air circulation and prevent mold growth. To avoid a chimney fire from creosote buildup, the National Fire Protection Association (NFPA) recommends chimneys be cleaned once a year. You could clean your chimney yourself, but it’s best to hire a chimney sweep certified by the Chimney Safety Institute of America. A sweep knows about building codes and can recognize potential problems. If you’re not afraid of heights, cleaning gutters is relatively easy. Depending on where you live and the kind of trees you have, you should do it in spring and fall. Start near the downspout and grab the larger debris first and dispose of it in a bucket. Then flush the gutters with a hose from the opposite end of the downspout. 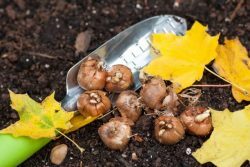 Fall is a great time to plant bulbs for spring flowers because the cooler air is easier on plants, but the soil is still warm, which allows roots to grow until the ground freezes. Irises, tulips and daffodils are good options, best in full sun. Just dig a hole two to three times deeper than the bulb is tall with the pointed end up. Turn off all faucets and drain garden hoses. Disconnect them from the outside spigots and store them in a dry place so any residual water doesn’t freeze. Put away your seasonal furniture and outdoor flower pots and lawn and garden decor as well. Rake and remove leaves from the yard and apply fertilizer to prevent winter damage. Finally, empty the fuel from your mower. Sharpen the blades and get repairs done now so you don’t have to worry about them in the spring. This entry was posted in DIY and tagged bulbs, chimney, fall, gutters, hoses, preparation, to do list. Bookmark the permalink. ©2016 DIYalogue. All Rights Reserved.